When you spend a lot of time enthusiastically recommending a favourite writer to people unfamiliar with him, it's easy to acquire that cosy feeling that you're one of the initiated, spreading the word to those who aren't. For many, that used to be the case with Henning Mankell; crime aficionados who had discovered the Swedish master could hardly wait to extol the virtues of his wonderfully written novels -- and Mankell’s taciturn copper, Kurt Wallander. But the days when Mankell and his creation were known to just a privileged few are long over. There has already been an acclaimed television series made for the Scandinavian territories, and a major new English-speaking series beckons (starring Kenneth Branagh); even more fame is guaranteed for the writer and his detective. 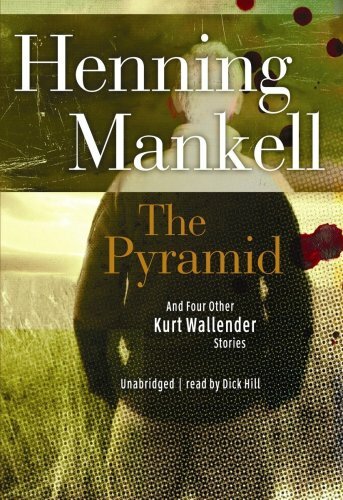 So the time is probably right for The Pyramid, even though those of us who enjoyed putting out the word about Mankell will have to relinquish their proselytising role. Wallander first appeared in Faceless in 1991, when he was a senior police officer just out of his 30s and with his private life in chaos. The stories here describe his early years: the events, the people and the crimes that forged the man we first met in Faceless. We encounter Wallander as a beat cop attempting to crack a murder in his spare time; we follow him in his tentative first steps with Mona, the woman he has decided to marry (his wife, of course, had left him by the time of the events in that first book), and we are shown why his relationship with his father is quite so fractious. The elements that make the full length Wallander novels so successful are all here in microcosm: a cool, dispassionate treatment of crime, the understated evocation of the Scandinavian locales; and (best of all) the puzzling, fascinating character of the tenacious cop at the centre of the narrative.